January 16 (Renewables Now) - According to an analysis by the SUN DAY Campaign of the latest data released by the Federal Energy Regulatory Commission (FERC), natural gas dominated new electrical generating capacity in 2018. However, renewable energy sources may be poised to swamp fossil fuels as new generating capacity is added over the next three years. 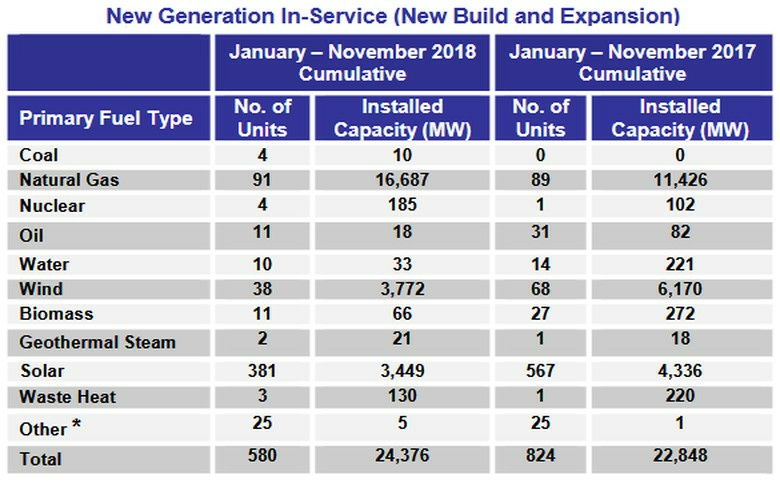 Net proposed generation additions from wind alone total 90,268 MW while those from solar are 64,066 MW -- each greater than that listed for natural gas (56,881 MW). FERC lists only a single new 17-MW coal unit for the three-year period but 16,122 MW in retirements. Oil will also decline by 1,362 MW while nuclear power is depicted as remaining largely unchanged (i.e., a net increase of 69 MW). FERC's data also reveal that renewable sources now account for 20.8% of total available installed US generating capacity. ** Utility-scale solar is nearly 3% (i.e., 2.94%) while hydropower and wind account for 8.42% and 7.77% respectively. * FERC only reports data for utility-scale facilities (i.e., those rated 1-MW or greater) and therefore its data does not reflect the capacity of distributed renewables, notably rooftop solar PV which accounts for approximately 30% of the nation's installed solar capacity. ** Capacity is not the same as actual generation. Capacity factors for nuclear power and fossil fuels tend to be higher than those for most renewables. For the first ten months of 2018, the US Energy Information Administration reports that renewables accounted for 17.6% of the nation's total electrical generation - that is, a bit less than their share of installed generating capacity (20.8%). FERC's 6-page "Energy Infrastructure Update for November 2018" was released in early January 2019. It can be found at: https://www.ferc.gov/legal/staff-reports/2018/nov-energy-infrastructure.pdf. Ken Bossong is Executive Director of the SUN DAY Campaign, a non-profit research and educational organiсation promoting sustainable energy technologies as cost-effective alternatives to nuclear power and fossil fuels.